CD8 Tregs express CCR7, home to secondary lymphoid tissues, and suppress CD4 T cell activation. (A) Expression of FoxP3 and CCR7 was analyzed within gated peripheral blood CD8 T cells. One representative dot blot from 7 healthy donors. (B) Frozen sections from human tonsils were stained with mouse anti-human FoxP3 and rabbit anti-human CD8 antibodies. CD8 T cells were visualized with Alexa Fluor 488 fluorescence-labeled goat anti-rabbit antibodies. FoxP3 was detected with peroxidase-labeled goat anti-mouse antibodies. 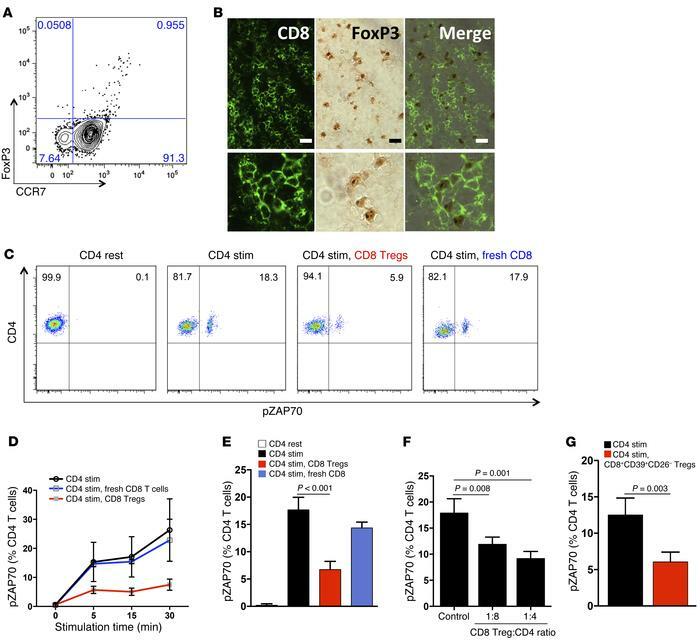 Merged images demonstrate CD8+FoxP3+ T cells in T cell–rich zones. Images are representative for 4 different tissues. Scale bar: 20 μm. (C–G) CD8 Tregs were isolated directly from PBMCs or generated ex vivo. Noncultured, fresh CD8 T cells served as controls. Naive CD4 T cells were mixed with CD8 T cells (1:1 ratio) and activated with anti-CD3/CD28 beads. (C) pZAP70 in CD4 T cells was measured by flow cytometry. A representative example of pZAP70 expression after 5 minutes of stimulation in the presence and absence of CD8 Tregs. (D) Frequencies of pZAP70+ CD4 T cells were monitored over a time span of 30 minutes following activation. Results are shown as mean ± SD from 4 independent experiments. (E) Frequencies of pZAP70+ CD4 T cells were measured after 5 minutes of stimulation in 19 independent experiments (mean ± SD). (F) CD4 T cells were mixed with CD8 Tregs at different ratios, and pZAP70 in CD4 T cells was measured by flow cytometry. Date are mean ± SD from 4 independent experiments. (G) CD8+CD39+CD26– Tregs were sorted from peripheral blood and immediately tested for suppressive function by mixing them with CD4 T cells. Percentages of pZAP70+ CD4 T cells (mean ± SD) were measured by flow cytometry in 3 independent experiments. Unpaired 2-tailed Student’s t test was used for comparisons.